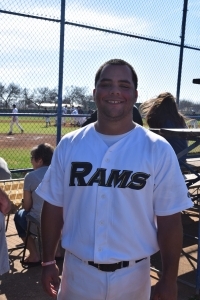 The Texas Wesleyan Rams (5-2) swept a double-header (two eight-inning games) at home against the Jarvis Christian Bulldogs (7-6) by identical scores of 8-7. 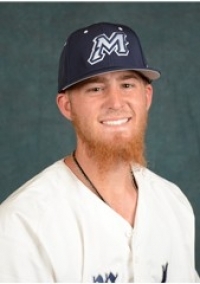 First game: The Rams took a 3-0 lead in the bottom of the first on an RBI single by 1B Julio Ibarra (Caracas, Venezuela) and a two-RBI single by C Aidan Laurini. They led the rest of the way. The Bulldogs got one back in the top of the second on an RBI single by DH Chase Martinez, and another in the fourth on a solo home run by C Carlos Andrade. 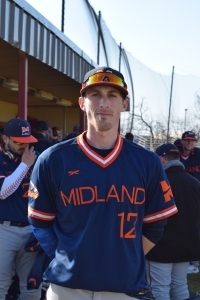 The Rams added another run in the fifth on an RBI single by SS Casey Moses, and two more in the sixth on an RBI single by DH Dylan Measells (Stuttgart, Germany) and Ibarra scoring on a wild pitch. The Rams led 6-2 after six innings. The Bulldogs got back into it with three runs in the top of the seventh. CF DeAndre McGuire hit a single into left field with two runners on base. The left fielder lost track of the ball. McGuire came all the way around to score, and it was a one-run ball game. 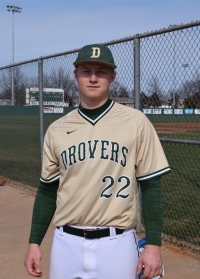 The Rams answered with two runs in the bottom of the seventh; LF Blake Seaton hit an RBI double, was bunted over to third, then scored on a sacrifice bunt by C Garett Crook. 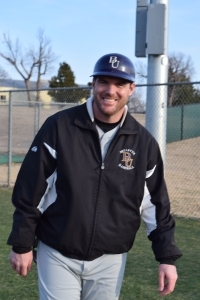 The Jarvis Christian Bulldogs (6-4) and the Tabor Bluejays (2-1, ranked #10 pre-season) split two seven-inning games. 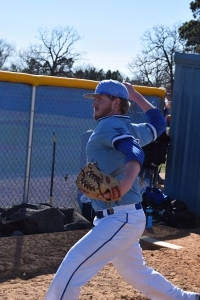 The Bulldogs won the first game 9-7, and the Bluejays won the nightcap 6-3. First game: The Bulldogs took a 6-0 lead in the bottom of the third inning. RF Christopher White got it started with a one-out single. 2B Alex Garcia walked, then CF DeAndre McGuire laid down a good bunt. So good that Tabor 3B Kyle James had to rush the throw to first. It was off-target, and the result was, McGuire got two RBI on the bunt. McGuire then scored The next batter, 1B Carlos Andrade, walked. DH C.J. Tyler hit an infield single, then LF Spencer Thomas hit a three-run home run. The Bluejays got two back in the top of the fourth, on RBI singles by DH Blake Standiford and James. C Braxon Byfield hit a sacrifice fly on a good turn at bat in the top of the fifth. The Bulldogs got a run in the bottom of the first when McGuire singled, then scored when a fly ball hit by Thomas was dropped. That made the score 7-3 for the Bulldogs. The Bluejays tied it in the top of the sixth. 1B Colton Flax hit a leadoff double, and scored when CF Brent McClure hit another double. McClure scored on a single by James. 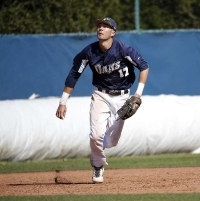 James stole second, then scored on a single by SS Abdiel Alicea (San Juan, Puerto Rico). He scored on a single by RF Jordan Harris, on a good at-bat. The Tabor Bluejays (ranked #10 pre-season) got a win in their season opener, and the Wiley Wildcats are still looking for their first win. This was the Wildcats’ home opener. The Wildcats had a chance. They took a 3-2 lead in the bottom of the fifth (of a seven-inning game) when Jerry Johnson, pinch-running for 3B Ruben Hancock, scored on a squeeze bunt by SS Trevor Spear. Hancock opened the inning with a double. A failed bunt attempt left him at second. He went to third on a single by 2B James Richey, and was replaced by Johnson. The inning ended when C Oswaldo Palacios grounded out, stranding runners at second and third. The wheels came off in the top of the sixth. 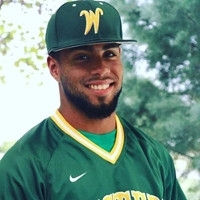 The Wildcats brought in reliever RHP Tre’von Thomas. He walked the first batter he faced, SS Abdiel Alicea (San Juan, Puerto Rico). The next batter flied out, then a pickoff throw from the catcher to first base went over the head of the first baseman, and nearly all the way to the right field fence. Alicea scored all the way from first, tieing the game 3-3. C Braxton Byfield, who was at bat, doubled, and was replaced by courtesy runner Kyle James, who went to third on a bad pickoff attempt by Thomas. James scored on a single by 2B Jacob Jones, giving the Bluejays a 4-3 lead. Jones ended up going to third on a passed ball, then scored when a ground ball by CF Brent McClure was bobbled by the shortstop. 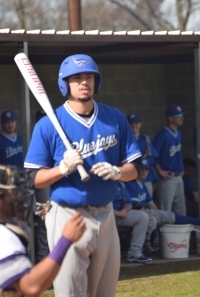 The inning ended with the score 5-3, and the Bluejays added two more runs in the top of the seventh, when Alicea scored on a wild pitch, and 1B Colton Flax hit an RBI double.